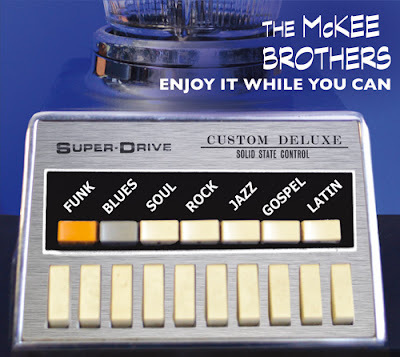 I just received the newest release, Enjoy It While You Can, from The McKee Brothers and I love it. Opening with One Of Us Gots Ta Go, a jazzy blues track in the style of WW Washington, this track is hot! Featuring Bob Schultz on lead vocal and Kirk Fletcher on lead guitar this track swings. Denis McKee on guitar, Bobby West on piano, Jim Alfredson on Hammond, Duncan McMilan on Wurlitzer, Ralph McKee on bass and Jerome Edmonson on drums is a solid unit but throw Lee Thornburg on trumpet, Doug Webb on sax and Sophia on backing vocal and you have pure power! Funky, Change, has a slinky feel and a cool bass line by Bobby Watson. Schultz's vocals are super and Fletcher trading off with the horn section and really nice accent vocals by Melissa McKee make this a really sweet track. A real screamer, A Little Bit Of Soul features Larry McCray on lead vocals and guitar. I really like Larry's vocals and his guitar work is crisp. The horn section is tight and a driving bass line from Bobby Watson really works. This music is woven like fine silk with Dennis, Melissa McKee and Maxann Lewis bringing the backing vocals. Excellent! Title track, Enjoy It While You Can, finds Schultz back up fron on lead vocals and and features smoking guitar solos from McCray and Stan Budzynski. Tight drum work by Edmonson and the back pump by the horn section is essential. Bluesy ballad, A Long Way Back Home, has a nice gospel like organ base by Alfredson and Dave mcKee shows his own flare on lead guitar riffs. Very nice. Melissa McKee and Sophia Hanifi really blend nicely on backing vocals and Webb hits a nice stride of his own on sax. Very nice. Another jazz funk number with hot bass riffs, Connections, will have you moving in your seat. Watson sets the pace and Schultz rides the groove. Fletcher on lead guitar, Jonathan Ovalle on percussion and the hot horn section backed by Melissa McKee and Reggie Gonzales on vocals...excellent! If I haven't made it clear yet...I really like this release. Right There, features Schultz on lead vocal and Fletcher on lead guitar. Webb lays out a nice sax riff becoming a part of the constant refrain and the horn section is really rocking. Melissa, Sophia and Reggie and really hot and Webb's soloing is absolutely smoking! Fletcher is always on his game and this track is breathing heavy with super bari work under the bottom with Watson's bass. Excellent! Dr. John's Qualified is an absolute favorite with very little change in arrangement but with really nice slide work from Budzynski as well as cool wah wah effects. Edmonson's drum funk is tight and thumping bass work from Watson is really solid. Thornburg on trumpet and trombone and Webb on tenor and bari gives the track extra pop ... yes... Schultz's lead vocals are super and of course any Dr John track would be dead in the water without super piano work by Dennis McKee. Desperate Situation is a cool R&B track which should easily get a lot of radio play with it's hook. This release is so well put together that I can tell you right now it is one of the best releases I've heard this year. McKee's guitar work hits all of the accents and the backing vocals are rich. The horn work on this track is spot on and parts like the subtle soprano sax solo by Webb are so unexpected and cool. Getting the James Brown on with a rolling funk, Dennis McKee takes the lead on vocal with refreshing ease and Larry McCray sits back and steps on the gas riffing high over a rolling bass line by Ralph McKee and Glenn Giordano. Very nice. Earl King's, It All Went Down The Drain, has a looser feel with deep bari sax notes pushing the train. Stan on slide, Rick Berthod on fills, Dave Kaftan on second solo, Dennis McKee on tremolo guitar... this track has a lot going on. Wrapping the release is Patti Griffin's ballad, Up To The Mountain, featuring Melissa McKee on lead vocal. McCray has the lead guitar playing a really nice melodic but screaming solo and Barsimanto the drums. With choral like horn work by Thornburg and Webb, this track is a solid cruiser.